One anonymous Twitter user, who's name was literally AnonymousQ1776, is the only person actually quoted in CNN's article as actually having a problem with it. 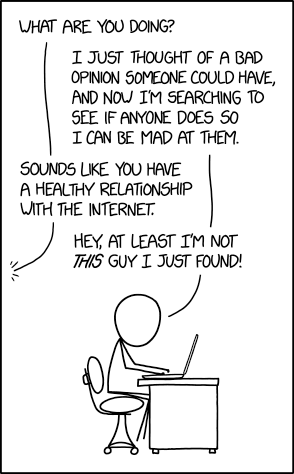 "Anonymous online people" are not a valid reference point. Stop gang banging the Outrage Dog Whistle. I didn't even know about the video until I saw this thread, I then went on Twitter, and it's trending, and the only comments I see are people smiling about the video, and saying the conservative plan backfired. It was one idiot, who doesn't like a video showing college kids having fun. So that I am clear. An anonymous twitter account posted a video of a young AOC dancing with a caption implying this was outrageous. A lot of other people of similar notoriety attacked the post as outrageous/silly. As far as I can see, there is no part or side of this story that I care about except that I am always amused and befuddled by stories where in the outrage over the outrage is the only reason I know about the event in the first place. There some sort of escheresque quality to politics these days. An ouroborous of outrage, only with two snakes eating each other's tale. Essentially the story is "One totally anonymous person online said a negative sentence about one elected official." We'd need a dozen 24 hour news channels just for this board if that was the standard, the "Oh the fact that we're talking about it makes it newsworthy" Mobius Strip logic not withstanding. However, once again, the story could be "Alexandria Ocasio-Cortez was an adorable dork with good rythm in college". I'm ok talking about that, is all I'm saying. Last edited by uke2se; 4th January 2019 at 07:53 AM. The fact she has dumb ideas should be the only real objection. Which of her ideas do you think are dumb? I don't know if you remember this, but there was a time when Obama was strong on border security, and I certainly wasn't going to vote for a kook-job, Romney who could look at you with a straight face and tell me he believed the John Smith Golden Plates story. I am also for a government health care system, and at the time, I was hoping O-Care would work. (Before my deductibles went up over 800%) Why can't an Obama voter vote for Trump? I would have voted for Bernie if he had won the nomination, along with most of my Union colleagues here in Michigan. Because President Trump was not and is not a viable candidate for that office. It is not an issue of voting for Republican, or conservative principles. The issue is voting for Hector Commacho Mountain Dew whatever his name was. One of the dimmest bulbs known to the general American public. The Birther Boy himself. One of the most crass and divisive habitual liars in the public eye. And dumb as a brick to boot. It's not about what he could do for you. It's that he won't be able to do much for anyone. I suspect you're correct. There are lots of shallow dimwits who respond to superficiality, never mind substance. For a Trump voter to support AOC makes no sense. She opposes everything Trump stands for. For an Obama voter to support Trump makes no sense. Trump opposes everything Obama stands for. We saw this in 2016 when Trump and Bernie both appealed to a certain demographic. A demographic that was moved by an angry white man, diametrically opposing policies be damned. Don't get me wrong. I enjoy her on this video! The underlined statement undercuts or even completely refutes the rest of that. There are a lot shallow dimwits that respond to superficiality, things like charisma, charm, wit, and empty slogans. Obama had a lot of the first three and some of the last as does AOC, trump only has the last two. It shouldn't be a surprise that some folks respond well to all three. It is remarkable that some of you seem to think that no ill-informed idiots voted for Obama. I'll start, a federal jobs guarantee. Last edited by ahhell; 4th January 2019 at 07:58 AM. Using 21 trillion in military accounting errors to pay for healthcare (even though the US hasn't even spent 21 trillion on the military in total). They can of course, and did. If they had a shred of awareness however, they'd realize they were voting against self-interest. Instead they twist themselves into a pretzeract (a multi-dimensional pretzel) trying to shoehorn their shiny object fixation into something resembling a rational position. Escheresque and Mobius strip politics. These are useful and apt descriptions. This kind of self-perpetuating outrage machine will definitely inspire fraud, à la the college students who paint self-targeting racist graffiti or hang nooses in their own dorm rooms. To be fair, Trump only has one half of a wit. I am more satisfied with his results than with Obama's results. I'm sorry you don't approve of my right to vote for who I feel is best for me and my family. What's even more remarkable is the extent to which you're jumping to hasty conclusions. I readily concede that ill-informed dimwits voted for Obama. Next time, ask for clarification before you step up on that soapbox. Last edited by varwoche; 4th January 2019 at 08:12 AM. What has Trump done to reduce your deductable on your health insurance? What in the name of sweet baby jesus?!? Criticizing the choice you made is not disapproving your right to make a dumbass choice. Nobody wants to take away your right to make terrible mistakes. Just with an entire subculture dedicated to finding the "bad opinions" and spoon feeding them to Outrage Addicts so they don't even have to put the effort into finding them themselves. There is no story here. There is no non-forced or manufactured outrage. Nobody gives a **** about AOC dancing in college. Not the President, not one of her fellow members of Congress, not one Republican State Senator or City Councilman or 3rd Assistant Roadkill Scrapper from Dishrag, West Virginia has said word one about this. One completely random and anonymous person online found an old video of a newly elected politicians and shared it with a negative caption. That's literally all that has happened. It's one step above a goddamn LOLCat Photo. But the human centipede took over to make outrage out of nothing and are now using that outrage they made out of nothing to justify why they are outraged. It's like we've achieved Outrage Mutually Assured Destruction where both sides not Outrage First Strike capability. And now that it's been boot strapped up into being "a thing" from nothing the members of the tribes will get involved and work themselves into real outrage over the fake outrage and that will be used to justify it. "I had to get outraged before the other side got outraged so my outrage would be justified by the outrage they haven't shown yet and oh God I've gone crosseyed." Last edited by JoeMorgue; 4th January 2019 at 08:18 AM. I didn't question or disapprove of your rights, and I would hope that you knew that with some basic reading comprehension higher than, for instance, that of the sitting President. I question the wisdom of that decision. I personally vote in the interests of my country and consequently my children's future. Trump currently had the government shut down because he wants billions of US taxpayer dollars to build the Great Wall of Vanity, that he promised (foolishly) that Mexico would foot the bill for. This guy is going to hurt us, nothing more. But you are of course free to support him and his monumental ego, that gets nothing done. And you can get outraged over that happening. The issue is voting for Hector Commacho Mountain Dew whatever his name was. People really need to stop slandering poor President Camacho with this comparison. When faced with a crisis, President Camacho sought out the smartest person in the country, asked him to come up with a solution, and followed his advice. President Camacho would be an improvement. If you step back if you made even a token attempt at trying to surround yourself with smart people it would actually be hard to be a really "bad" President. To be clear, you are really the only one I'm seeing who is expressing a consistent level of outrage in this thread. Granted, it's early. I will concede I may have misread your post but it really did seem self contradictory. It seems as though you clarified a bit later. The last line was a generic response to several posters including yourself that seemed to take for granted that trump voters were dimwits and also that Obama voters could not possible vote for him on account of his bad ideas. Based on your clarification, its seems you are not in that camp. Stepping back from this issue specifically we are finally starting to see the first wave of "Internet Generation" politicians coming into power, people who are young enough to have essentially been "online" their entire lives with a trail of social media posts, pictures, videos, tweets, etc, etc that are just their for the finding. The shift from a politician being this public face to this a person who's entire life of ups and downs is going to be there for us to see is going to be an interesting one. The same problems would accrue. The sum total of dirt on Clinton was zero. Her words were misreported and enough of the Republican mud stuck that people believed their smear campaigns. The same would happen to any other female candidate. But it's not a question of "dirt", it's a question of charisma. Clinton doesn't have it. Ocasio-Cortez does. Sorta of depends on the national figure, Mitt Romney expressing outrage deserves note, Trump, I'm somewhat surprised he wasn't the first to tweet something about it. I expect there will be a 5 or 10 year period where people fake outrage over pictures or videos of someone taking a hit from a bong or drunkenly peeing in public or flashing folks at a party. Then we'll all get over it except a few old curmudgeons shaking their canes at the internet. Depends on what you're using it as a reference point for. In the case of this thread it's "wheeeee! This is fun!" It's one step above a goddamn LOLCat Photo. Yup. And those are fun, too. People have fun reposting and commenting on those, too. I honestly don't know where you're getting the idea of "outrage" from. If only the Internet Generation would get off our lawn. Except this is the internet, so maybe we need to get off their lawn? I mean, someone took the effort to dig up this video, right? That seems more involved than just some anonymous twitterer posting the typical "Socialist iz dum" crap you see everywhere. "It is not normal for elected officials to have a reputation for dancing well and I'm happy to be one." & "It is unsurprising to me that Republicans would think having fun should be disqualifying or illegal"
Trump's a bad example because with Trump there's no public persona and private personality there's just one big Id driven maniac. I think the jury is gonna be out for a while on whether or not Trump is a sign of anything to come or a one-off anomaly. But for actual humans with functioning psyches we're different to some degree in moments of privacy, with friends and family, in our "bubble" or whatever then we are "in public" or "on stage." Or to put in practical terms, anybody raise their hand if they would have a chance to be elected to high office if your worse post here splattered across the front page of the New York Times. She may be lumping this situation together with past actions, such as making particular recreational sexual activities illegal because the wrong people engage in them. It's just GOP politics. They're starting up a smear campaign in the event she eventually runs for President. Sure, it's backfiring *now,* but if she runs in a decade or so people will have mostly forgotten except that there was some kind of old video of her, and they can work that to their advantage. The credits listed her name as "Sandy". Seeing how entire conspiracy theories were hatched around Barack Obama having once been known as "Barry", I have little doubt they'll do the same for her. She's also a thin young woman with good posture. Women's clothes are basically designed for thin young women with good posture. That means she makes any outfit look good. Put her in a $10 dress from Kmart, she'll make it look like a $1000 dress from a designer. They've already been critical of her outfits, I expect that to continue with various photos of her, with captions claiming that she's wearing outfits that cost thousands of dollars despite her middle class background. I agree with your underlying premise: This was just some rando on twitter, and thus not really a big deal regarding the GOP at large. However, I think you're badly mischaracterizing the response. On my lefty twitter feed, it's not outrage; it's pointing and laughing. There's a heavy amount of sarcasm, but it's all in service of making light of the clown's antics. Now, if I may be so bold as to make a prediction: I get the funny feeling that some slightly-prominent right-leaning person (author, pundit, elected official, etc.) will end up actually latching on to the "embarrassing video" and treat it as a very real indictment of Ocasio-Cortez's character.